We dived at with Eco Divers from Kima Bajo in 2009 and the report written below applies specifically to that trip. Times change... 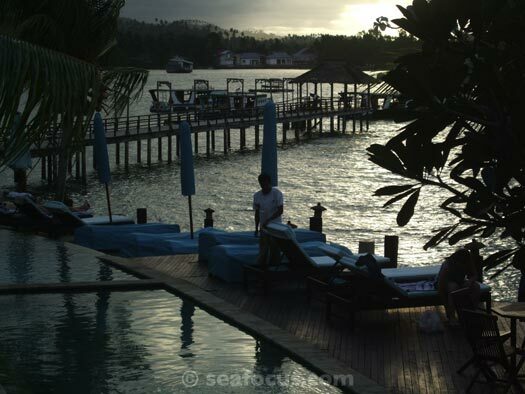 In early 2012, Eco Divers moved to the top class Minahasa Lagoon resort, based on the south side of Manado bay. At the time of writing, there has been no announcement on a new dive centre operator at Kima Bajo. Owned and run by Jim and Cary Yanni, two highly-experienced dive professionals – the onsite dive operation is pretty much faultless. 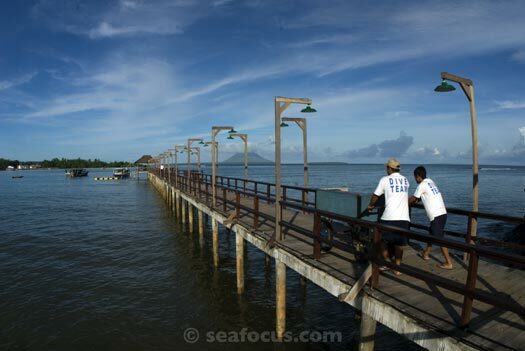 The office, briefing and kit storage areas are located at sea level just a few steps from the pool and jetty. Everything is well laid out although it's unlikely you will ever have to use the facilities – the dive crew collect your kit from your room on day 1, then set up and take it to the dive boat each morning. All you have to do is walk to the boat, check everything is on board and away you go. The crew are well-trained, friendly and helpful. We dived with two divemasters and they were both wonderful spotters and very flexible with a group of divers at mixed experience levels. 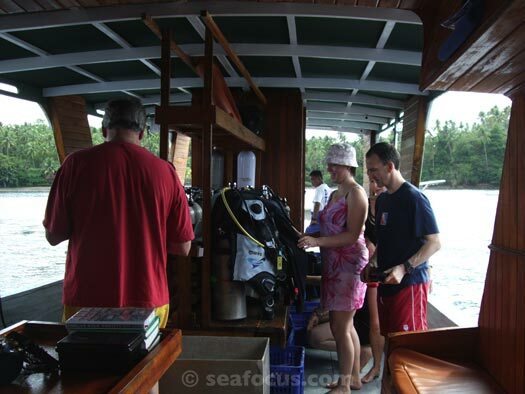 Trips are scheduled to leave after breakfast and do two dives before returning for lunch. 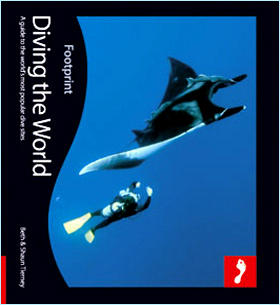 A third dive leaves in the afternoon and is often done on the closer coastal bays. Night dives are by arrangement. There is plenty of drinking water, tea and coffee, fruit and biscuits on the boats and all boats have a real toilet. For photographers, there is also a custom-built and enormous camera room with individual work stations. One point of note is that this was the first day-boat dive operator that we have dived with in a VERY long time, that supplied a decent sized, fresh-water camera rinse tank on the boat without being asked to do it. Top marks. The resort buildings nestle on a hillside as it leads down to the bay. There are three types of room. 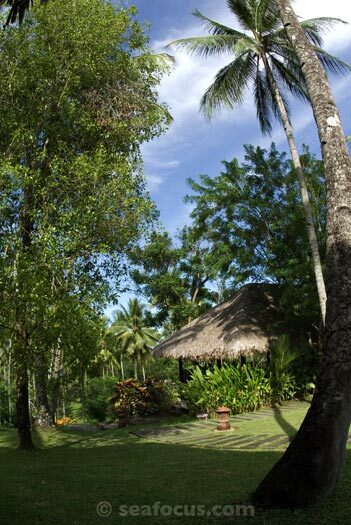 We stayed in a mid-priced one, which bought us a large, stand-alone bungalow with a balcony and views over nicely manicured gardens. 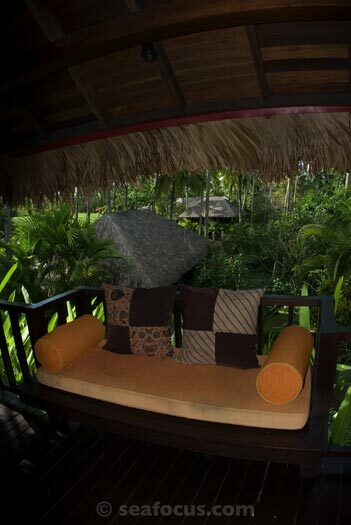 Furniture and decoration is Balinese style in gentle, neutral tones. There's a king-size bed with good quality mattresses and mosquito nets, fridge, tea and coffee, a desk for the photo-kit plus both and inside and outside bathroom. We never used the outside one as the mosquitoes were vicious. Everything worked – no hassles with the air-con or hot water, the free wi-fi connection was intermittent but fast when it was running and we were, generally, very comfortable. Our friends stayed in one of the cheaper rooms, which were smaller and built in a row of several others. The internal standards were much the same but with no balcony or view. 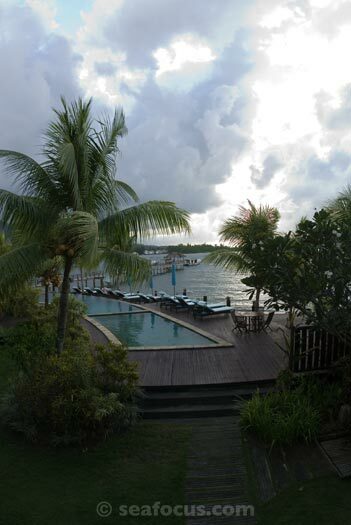 The most expensive rooms are located with views to the sea, although the trees and plants obscure that somewhat. Meals are included in dive packages and were all buffet style. The calibre and variety of food was excellent. The small bar area was cosy but our one disappointment was the cost of drinks, which were highly priced even when compared with other nearby resorts. The staff were all friendly and very helpful.